A large contract manufacturing company received an order to produce a high volume of complex shaped medical devices. The device is made from 6061 aluminum billet. Operations include face milling, end milling, boring, counter boring, slotting, spot facing, back boring, drilling, and reaming. The manufacturing engineers involved estimated the job using standard, catalog tooling and each job required 28 discrete tools. The estimated cycle time for processing the part was 27 minutes and would have required the manufacturer to purchase 3 additional machining centers at a cost of nearly $750,000. Additionally, the three added machines would have required 3 more sets of perishable tooling in addition to that for the existing machines. 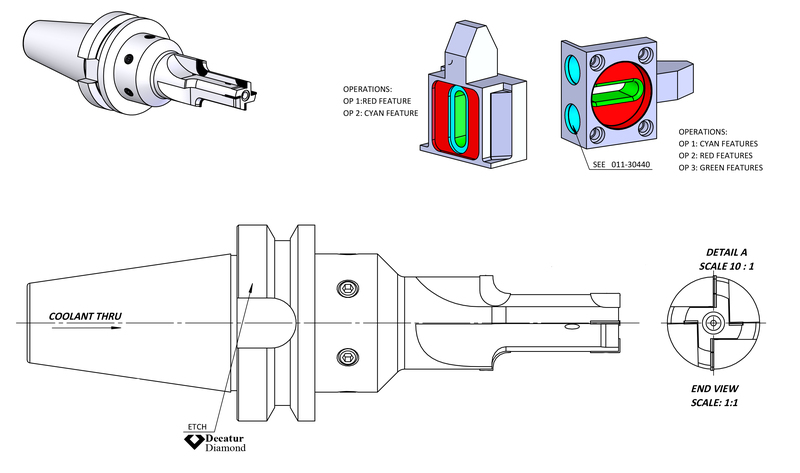 We were asked to review the processes to see if we could create dedicated tooling to both reduce the cycle time (primarily machining center purchase cost avoidance) and overall tool cost/unit produced. We managed to reduce the cycle time to under 6 minutes and the tooling cost/unit by 40% despite the initial purchase cost of the dedicated tooling being approximately 40% higher than the first kit of catalog tooling would have cost. We also reduced the number of individual tools employed to 10 from 28. © Decatur Diamond, LLC. All rights reserved.